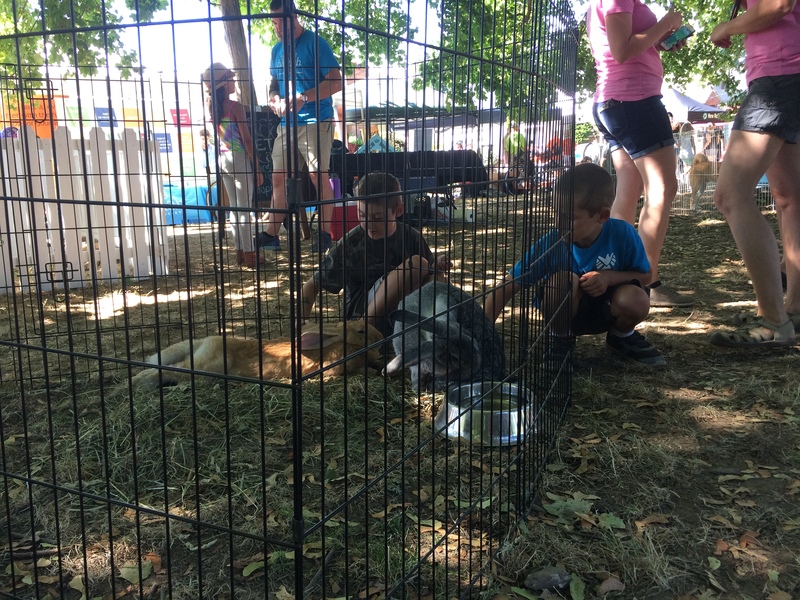 All the pictures: Portland, OR – August 18-24, 2016: 223 photos. 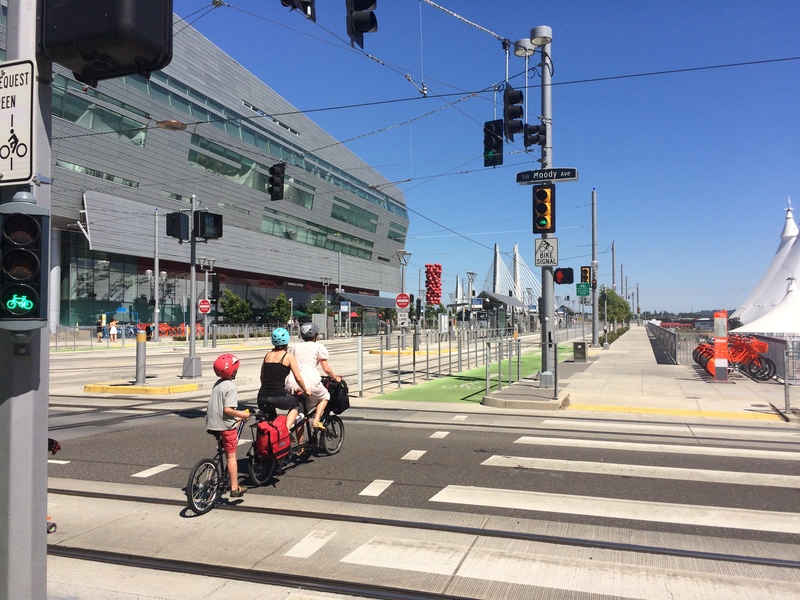 One nice thing about bringing a bike to Portland is that we have wheels to get to and from the train- or bus stations. 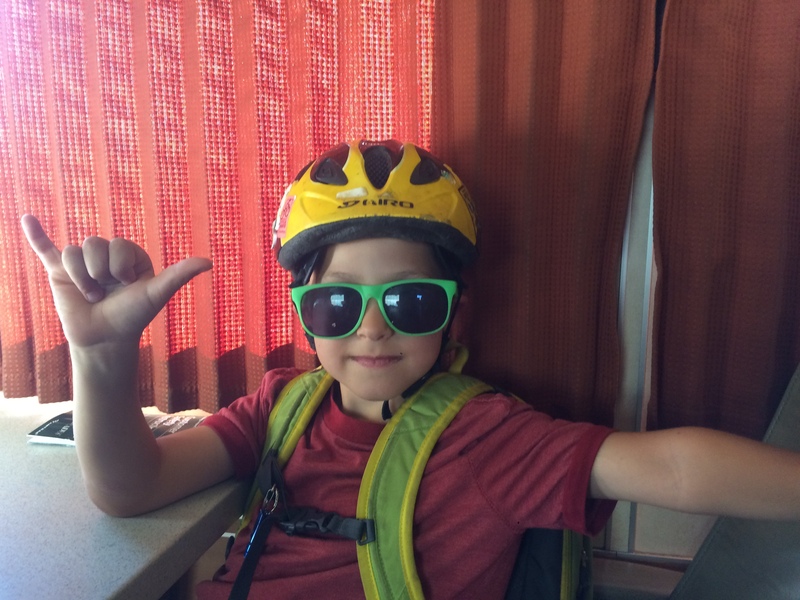 We generally take the bus once a month to visit the orthodontist 20 miles away, but we bring bikes so we don’t have to walk a mile or add a second bus transfer. So we’re not the best walkers…especially with luggage. This trip went as expected: walked across the street to catch the bus (easy peasy), then walked a few blocks to the train station where we had the obligatory discussion and investigation for stairs and elevators locations. One kid currently won’t use elevators and I wasn’t about to lug the big wheelie bag down a long flight of stairs so we worked out a plan together (of course interrupted by a helpful stranger letting us know the location of the elevator and my explaining that we were just accommodating the non-elevatoring kid, but thanks!) and split up. Always a fun little adventure and something I always forget is going to crop up. In Portland we had to walk a bunch of blocks from the train station to the bus stop and just missed the bus…but it’s a high-frequency line (does Seattle have that??) so we only had to wait 10 minutes. However, those 10 minutes involved a very curious bee and lots of screaming. And it was really hot. 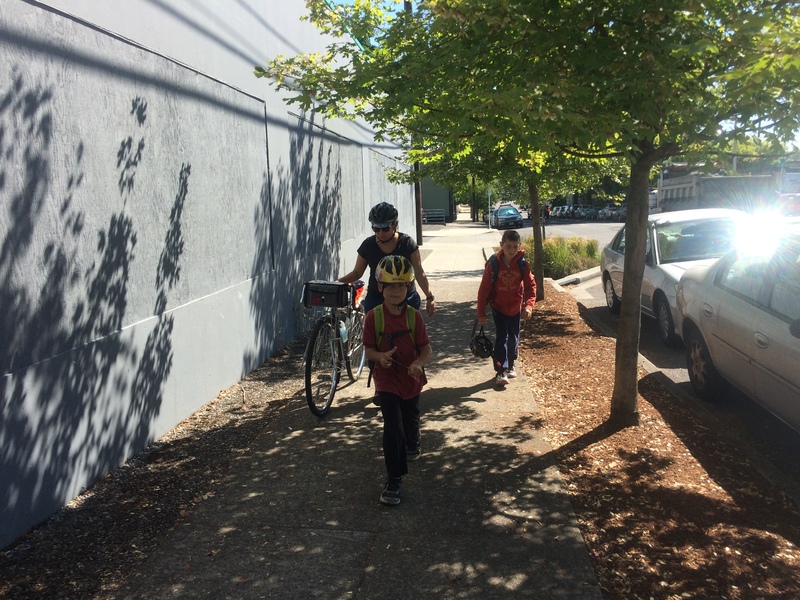 And then we walked two blocks from the bus stop to Clever Cycles and we all survived! Then I test rode with the kids and they complained that the small box was cramped. 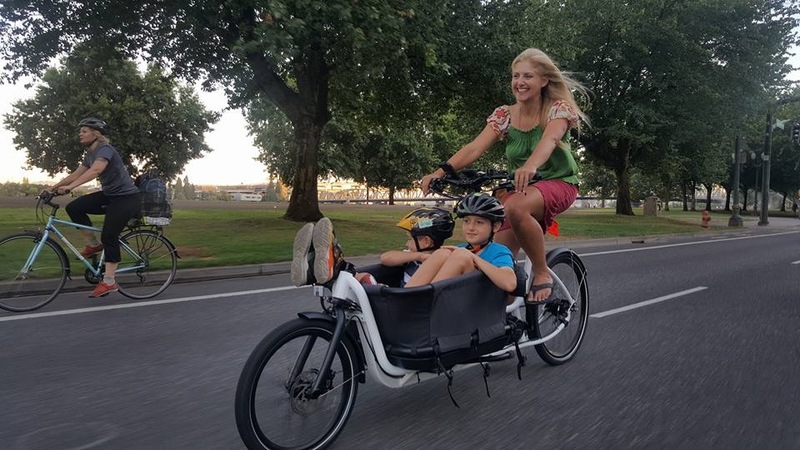 It was, but I love riding a bakfiets when in a flatter-than-Seattle city so there was no chance of me swapping for a different bike. p.s. Douze makes three sizes so don’t worry if you’re in the market! And anyway, adding the luggage after they said they were cramped made them appreciate what room they had. Like most things in life, it’s all relative. I grabbed a Yuba Cargo Strap (psst…there’s a hidden cargo strap theme for the week) from Clever Cycles to attach the bag and we were totally fine for the half-mile ride to our Airbnb. 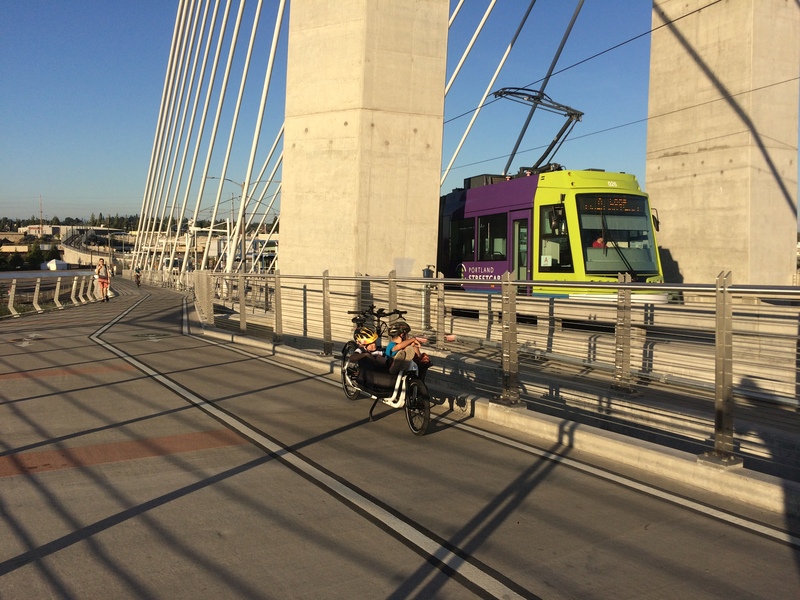 We ate dinner in and since it was only 7pm, we headed back out so I could show the kids Tilikum Crossing: Bridge of the People, the largest car-free bridge in the United States. I’ve been down to Portland a few times without the kids recently and have crossed the bridge countless times, but this was their first time. Super fun! And then we joined the Thursday Night Ride for the first half hour. I saw a bunch of people I know and was surprised to see a few Seattleites! Turns out there were a bunch of people in town for the International Open Streets Summit. 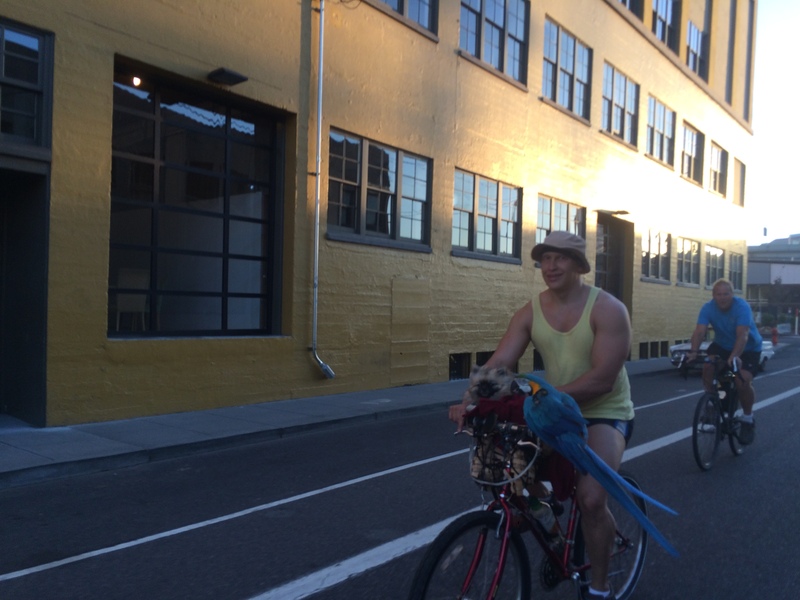 There are always a lot of amazing bike things to see in Portland, but I think the most amazing sight tonight was the guy with the parrot and Pomeranian on his bike. We attempted to start our day with second breakfast at Slappy Cakes (griddles built into all the tables–so dangerous, the kids love it! ), but the wait was too long so we hit the playground in Laurelhurst Park to kill enough time until Bricks & Minifigs opened. But first, speaking of killing things, the e-assist went out! At the bottom of a hill! Less than 24 hours with the thing and I was smitten so I sucked it up and begged the kids to walk uphill for one block as I pedaled up and we went about our day with plans to return to Clever Cycles in the afternoon. 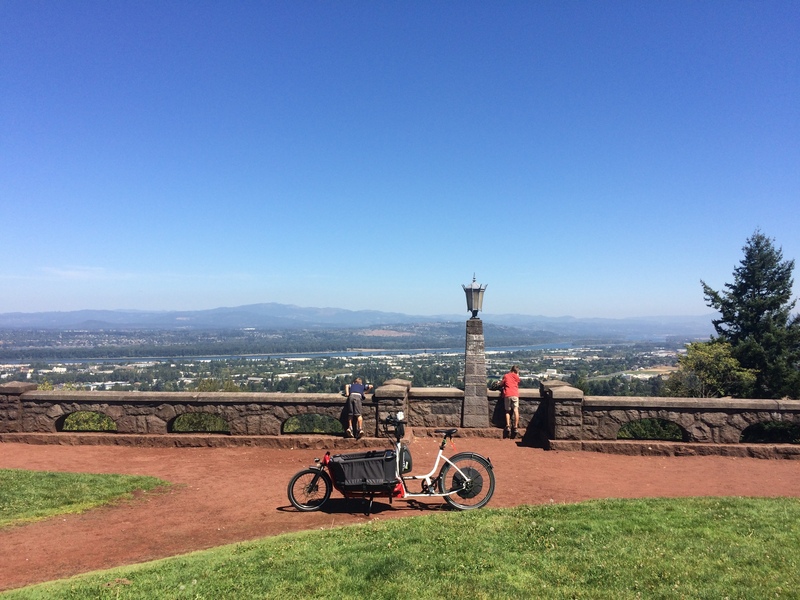 Portland is fairly flat, but any incline is noticeable with an unassisted cargo bike (I can appreciate any and all hills on my Big Dummy, for instance), so I was relieved we were uphill from everything else once we got up that block. 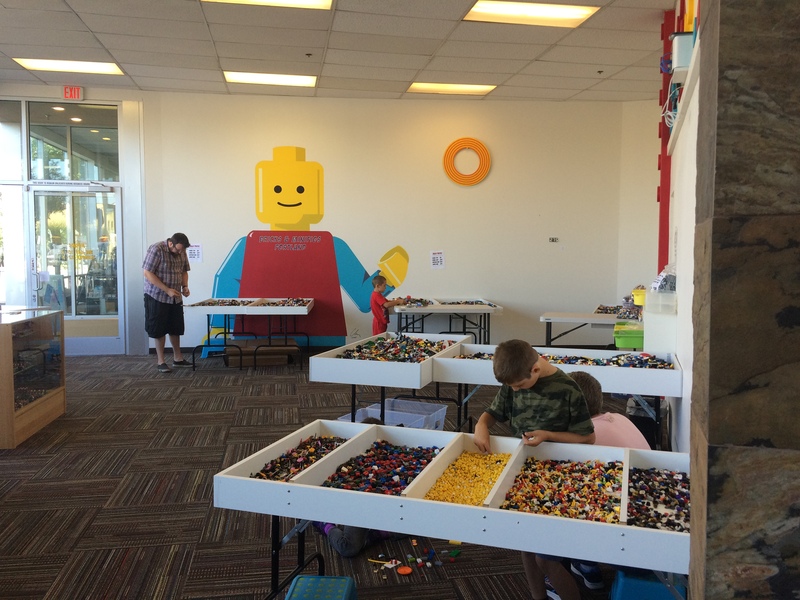 Let me tell you about Bricks & Minifigs: bins of used Lego bricks sold by volume! Tons of individual pieces ($3 seal yay! $9 pig I will never stop calling “The $9 pig, ugh”)! Current sets! Retired sets! Party rooms! Apparently they’re building one in Seattle! Oh, and Fred saw me post on Facebook that we were here so he came by to say hi. So easy to pop around the corner from work when you’ve got your bike at your disposal. After lunch at slightly lower elevation, we hit Clever Cycles while the kids played with more Legos and I swapped the e-RAD mid drive Douze for one with a BionX. Pretty similar, though I thought the e-RAD felt more powerful. But the BionX has a boost button for picking up speed from a stop, which is great for getting going through an intersection since the e-assist doesn’t kick in until you’ve started moving. Extra helpful with a heavy cargo bike. 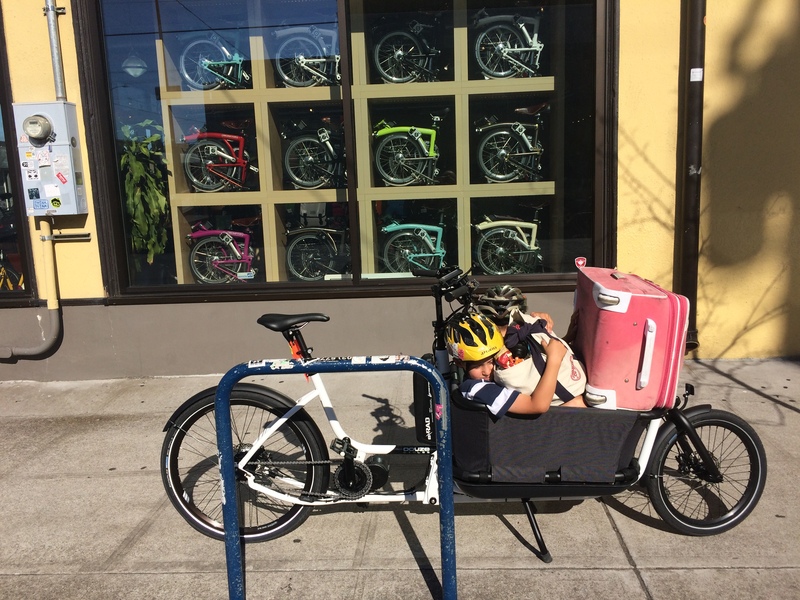 Then we visited Books with Pictures for comic books and to visit owner Katie Proctor, who is wonderful for a lot of reasons, but I find most notable for the awesome wooden boxes on her Yuba Mundo longtail cargo bike for holding an infant carseat. 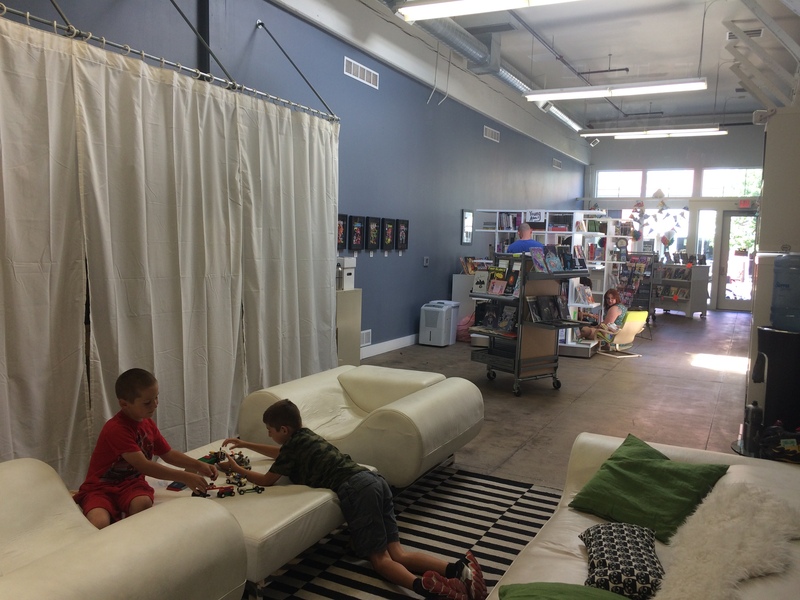 The store is new, this was my second visit and the kids’ first. Apparently the block was an auto body shop before so there’s no curb, just a block-long driveway. Which means no bike racks yet, until the curb goes in. But this is Portland so I bet that will happen soon. And the building is pretty and modern with AIR CONDITIONING which was really nice on this hot day. Katie arranged the front display with books all set in cold or watery places. How fun! 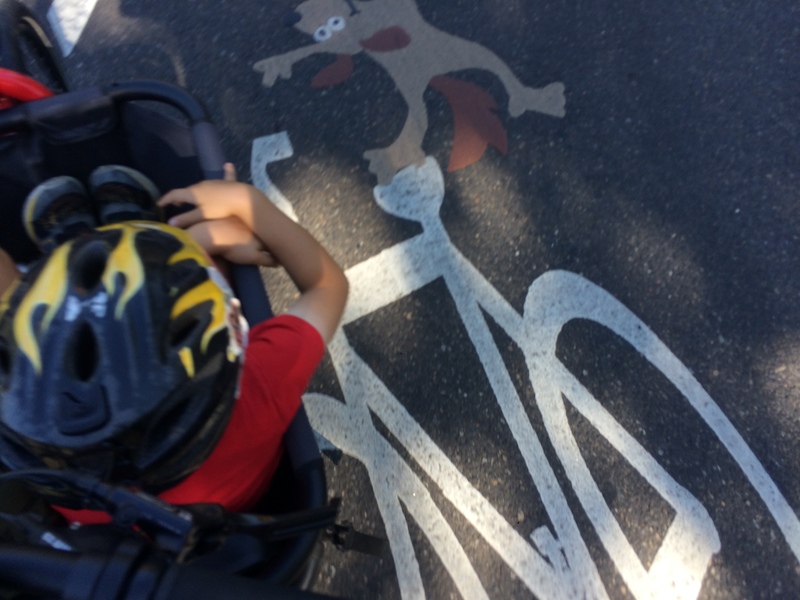 Dinner was at McMenamins Barley Mill Pub with kid menu and bike corral (I guess most Portland restaurants have bike corrals next to them now so it might not even be worth mentioning) via a spin around Ladd Circle because there are two cute dog sharrows. 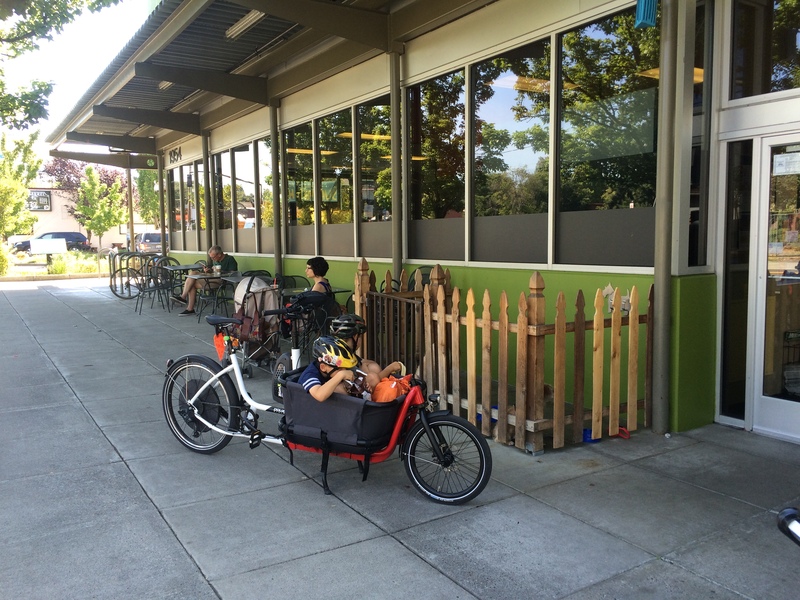 We started our day with a visit to New Seasons Market which is sort of like Seattle’s PCC Natural Market, but with much better bike parking and this one by our AirBnb had a dog corral! Then we visited Rivelo so I could get a couple John’s Irish Straps because they’re the best small cargo straps and I keep giving mine away because they’re too cool not to share. And then the main event: Kidical Mass! 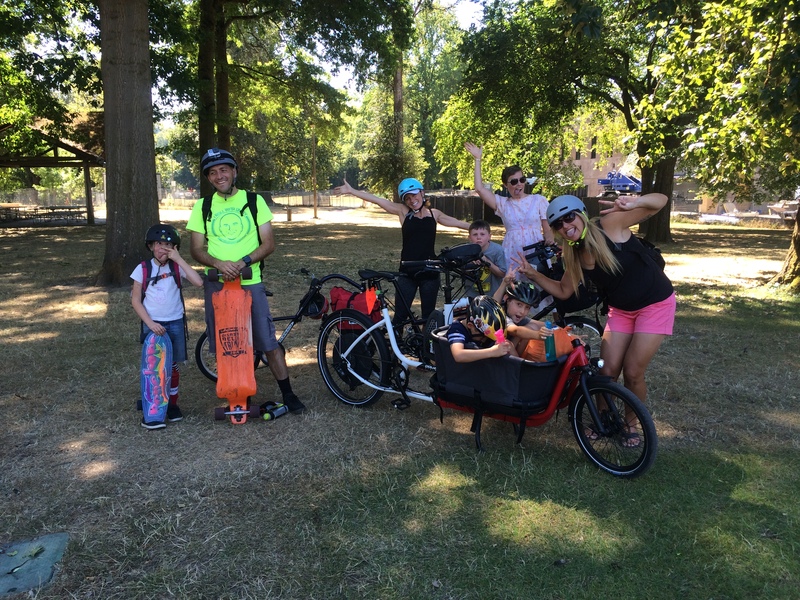 It was extremely hot out so our group was small: we three on our Douze, Ginger with her visiting sister and one of her two kids on her Circe Helios tandem bike (from Clever Cycles) with Burley Piccolo trailer bike, and Cory and daughter on their longboards. We had a wonderful ride and ended at a water park, thank goodness! 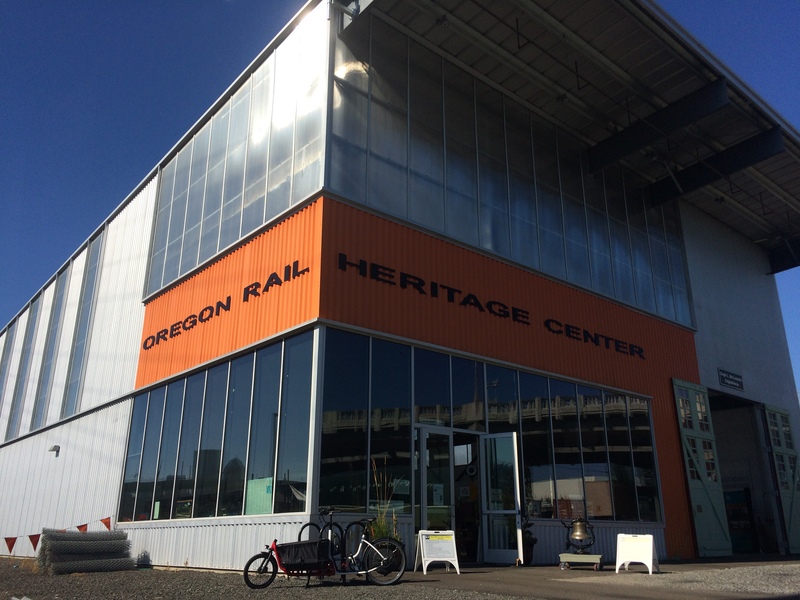 After parting ways with friends we paid a visit to the Oregon Rail Heritage Center train museum. This used to be our main reason for visiting Portland, but it’s been years since we were all about trains. It’s conveniently across the street from Rivelo so we still often end up near it, even if we don’t go in. The old engines are all inside and there are potties, drinking fountains, tables and chairs for snacking at, and couches by the train tables and fans so it was a great escape from the heat. We meandered home via the grocery store and a few murals. This sort of bike makes it particularly easy to stop and check out mural after mural without the kids getting impatient. 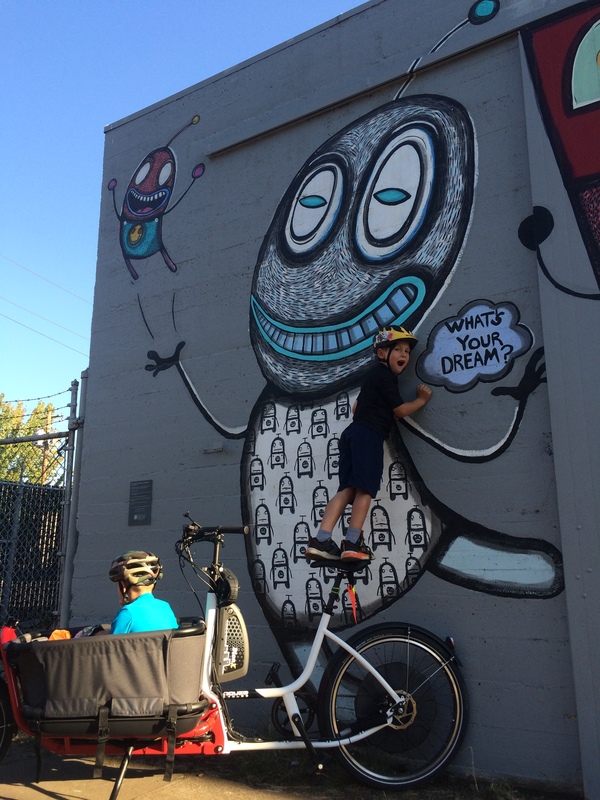 Sunday was the Southeast Sunday Parkways open streets event and IT WAS AMAZING. There were so many bikes (and our two skateboarding friends) out and wonderful activities at all the parks. The kids did rock climbing, bunny petting, and bounce houses, we stopped in at a house party, I tried a BIKETOWN bike share bike. We biked most of course, starting at Laurelhurst Park and making our way clockwise around to Colonel Summers Park. 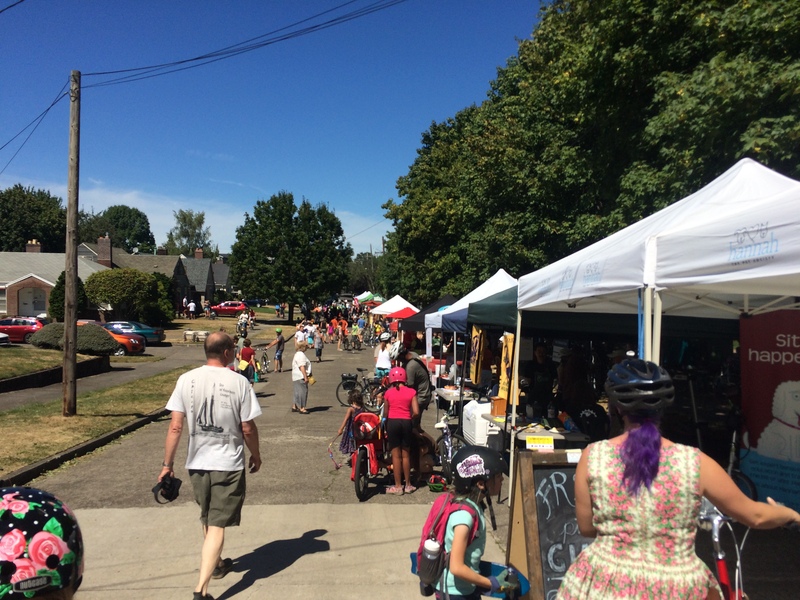 It was everything an open streets event should be, and a lot bigger than Seattle Summer Parkways and Seattle Bicycle Sundays. Not only was it longer, better attended, and packed with more activities, there were no cars! The Seattle events are more sort-of-open streets events with too few volunteers and inattentive police officers keeping some of the cars out. 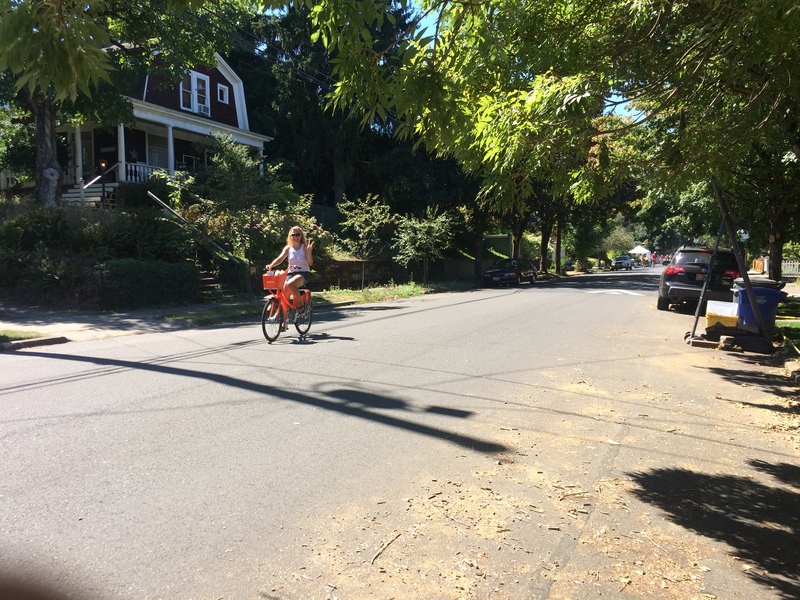 A friend told me that Portland originally had a similar system, but now uses construction traffic controllers who love getting waves and thank yous at Summer Parkways versus less grateful feedback from people in cars during their usual gigs. It’s really worth a trip down, and we’ll try to visit again for one next summer. 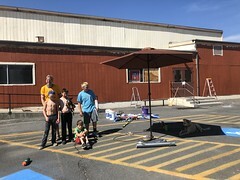 As we rested at Colonel Summers Park, getting a last bounce house bounce session in and watching everything get packed up, I watched another group of families quickly pack up to hit the road so they could be home before the cars were allowed back. It was a good reminder that not everyone feels comfortable biking on roads shared with cars and how important these events are. 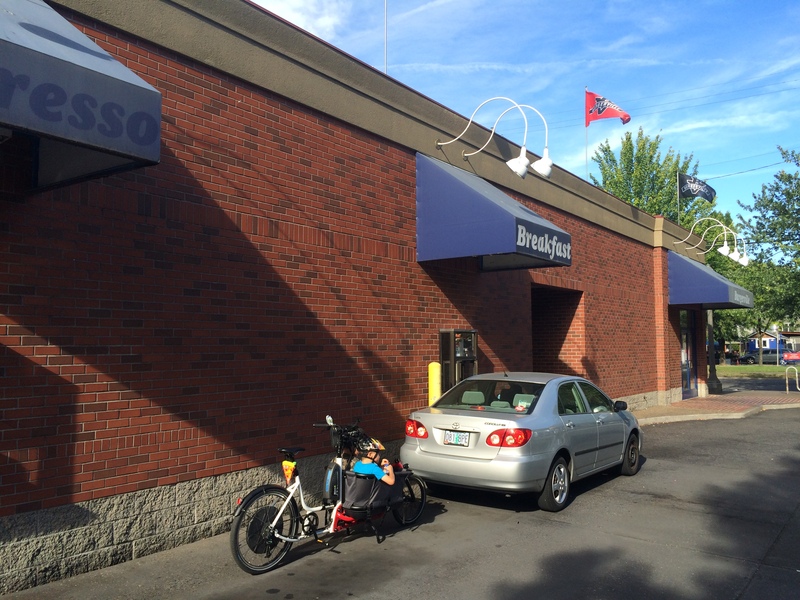 We did a little more sharing car areas on our way home and visited the Burgerville drive through since bikes are allowed! 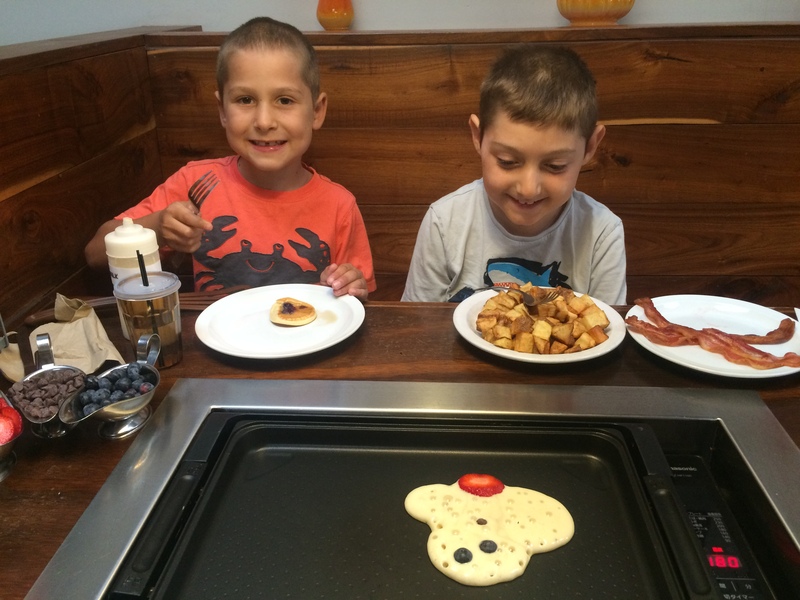 We started our day at Slappy Cakes–no wait on a Monday! Then we visited OMSI (Oregon Museum of Science and Industry) which is always fun, and nice for hiding from the heat, it turns out. 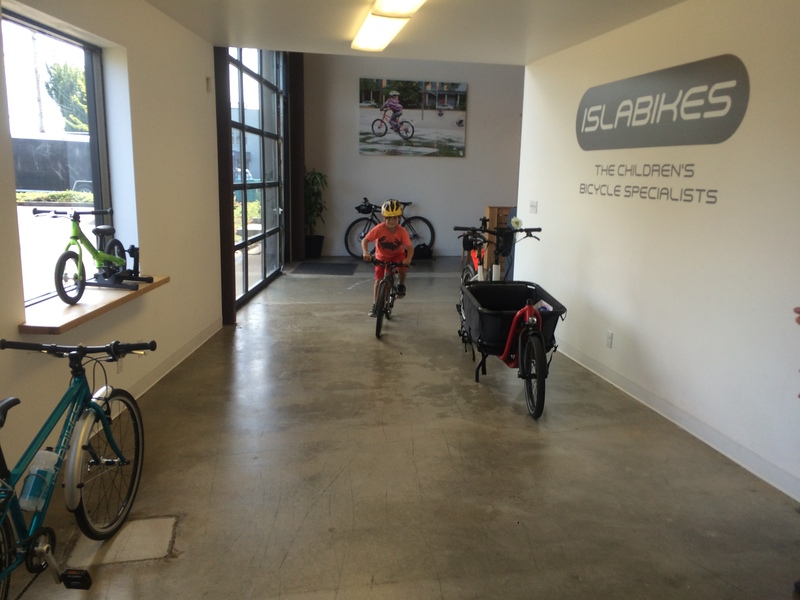 After OMSI we headed back across the Willamette for an appointment at the Islabikes Fitting Studio so my seven-year old could try out the Pro Series. He’s in between sizes so he zoomed around on the smallish 20-inch model with flat bars, but didn’t want to try the too-big 24-inch since he doesn’t like drop bars. We’ll stick with the regular series, but the Pro Series is super cool for more serious riders than us. 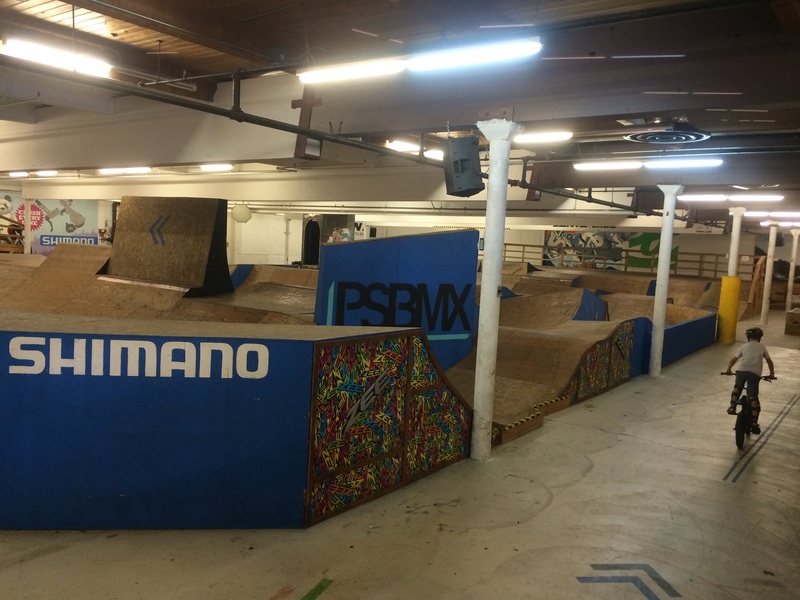 That wasn’t quite enough kid biking, though, so we checked out the Lumberyard Bike Park. My seven-year old LOVED it and quickly made friends with a regular and they disappeared for an hour while I stuck to the warm up track (me on foot) with my more cautious nine-year old. It’s mostly indoor, but there’s an outdoor section the little kids explored and when we couldn’t locate them at the end of our hour, I discovered there’s a basement area, too. I don’t think I ever want to try it, but the kids had a blast. First up was another bike shop visit–Metropolis Cycles–and another cargo strap purchase–Surly Junk Strap this time. 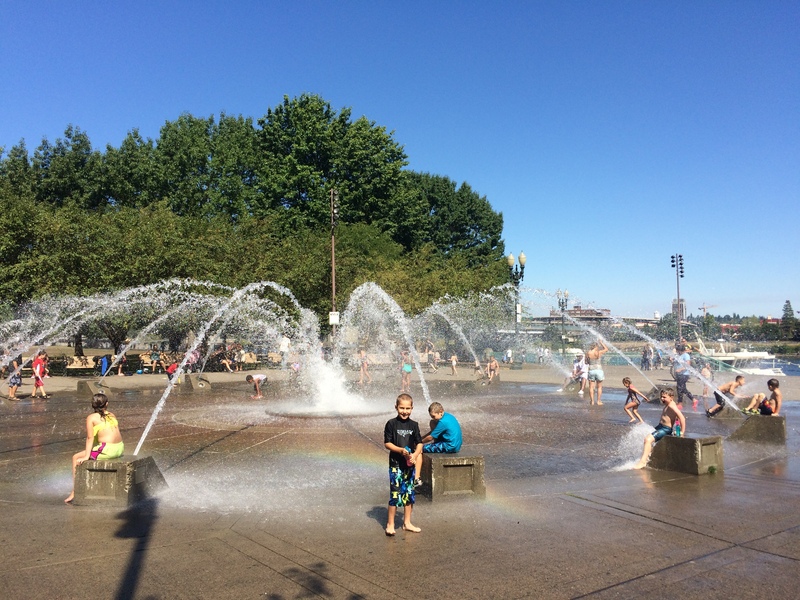 But we were really there because the kids decided I needed a bell and Metropolis was on the way to Dawson Park which was on the way to lunch with friends at Hopworks BikeBar. 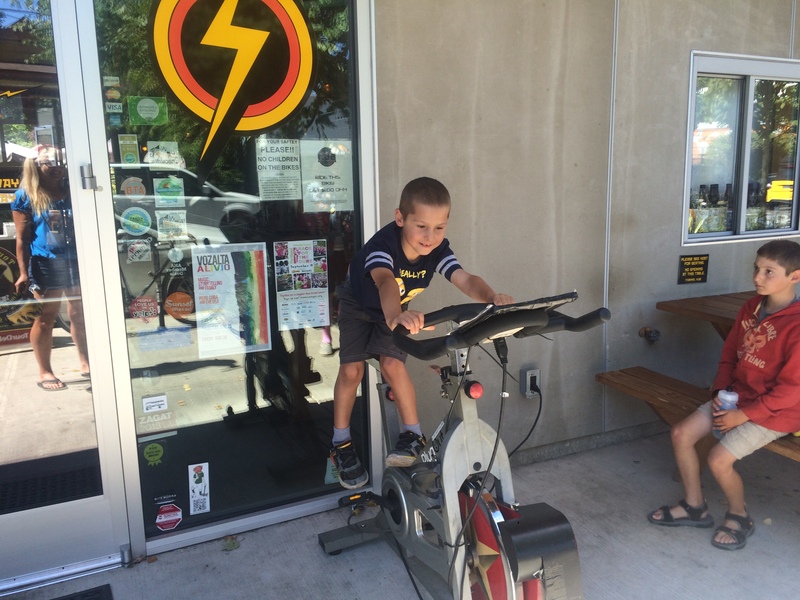 BikeBar is awesome for kids and adults alike. Lots of outdoor seating, as well as a little play kitchen. 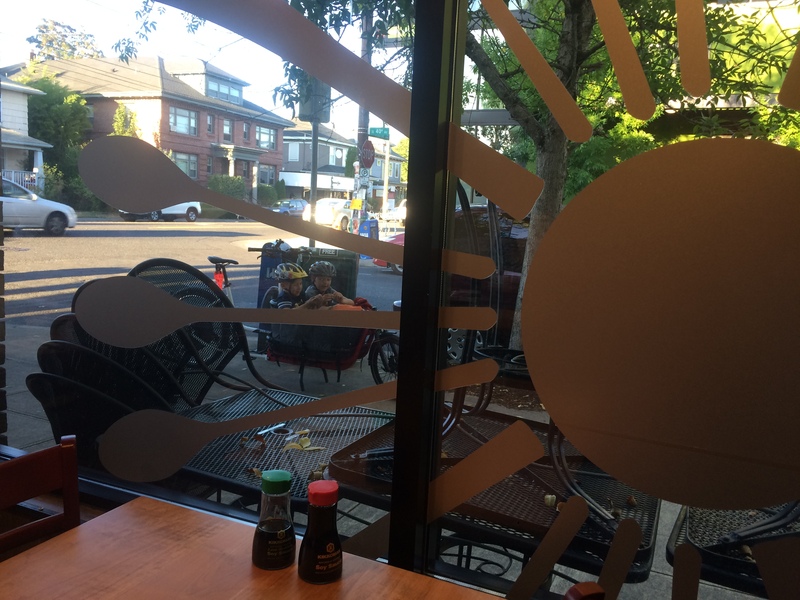 And there’s a stationary bike out front for powering the restaurant…though kids aren’t supposed to pedal it (shh!). Then I took the kids up Rocky Butte to see the awesome view. I’d been up once without them when I was visiting town for the Urban Cycling book signing party at Clever Cycles. I was on my Straggler with a borrowed kid that time. We hadn’t been up Rocky Butte long before the kid who isn’t currently willing to pee on trees needed to visit a restroom so I examined the map on my phone and we rushed down to nearby Glenhaven Park. Had I not been on the awesome e-assist bike I would have whined a little, but I figured we could easily bike back uphill after the potty visit. As it was, we ended up hanging at the playground for a long time and went straight from there to ice cream with friends. I’m sad to see The Maple Parlor is closed because it was terrific! I particularly liked that you pay up front and then pile on the heavy toppings–no weighing involved. 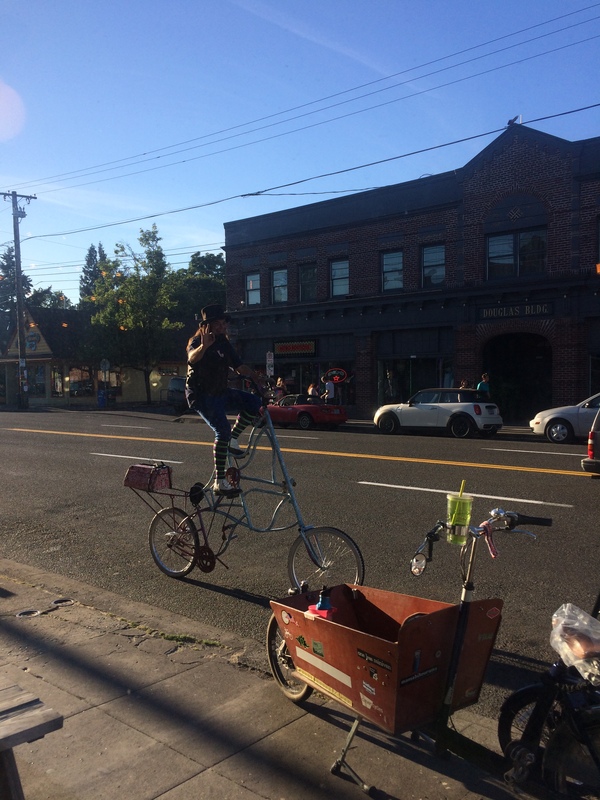 It’s right on Hawthorne, providing good people watching and Dingo of Olive & Dingo: Portland’s Favorite Clowns cruised by on his tallbike. 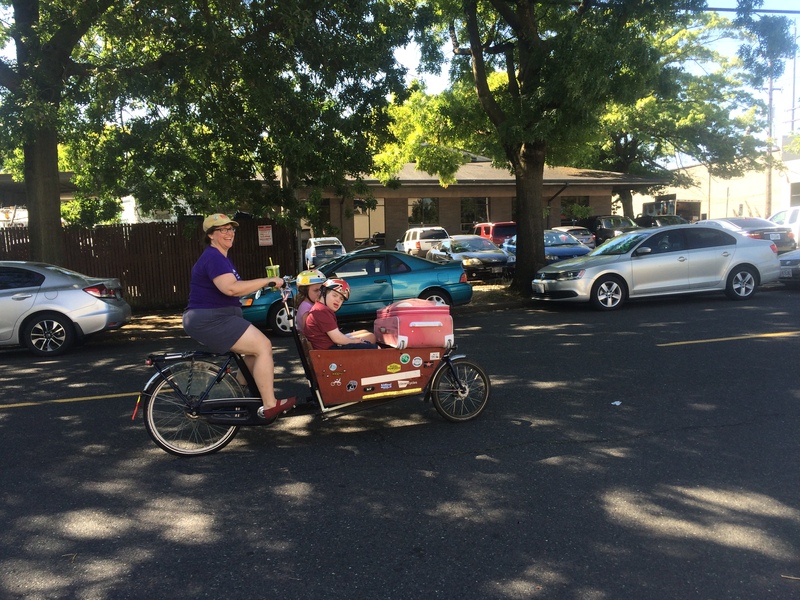 I took advantage of having a box bike for our last stop of the day and left the kids idling outside while I picked up to-go sushi. 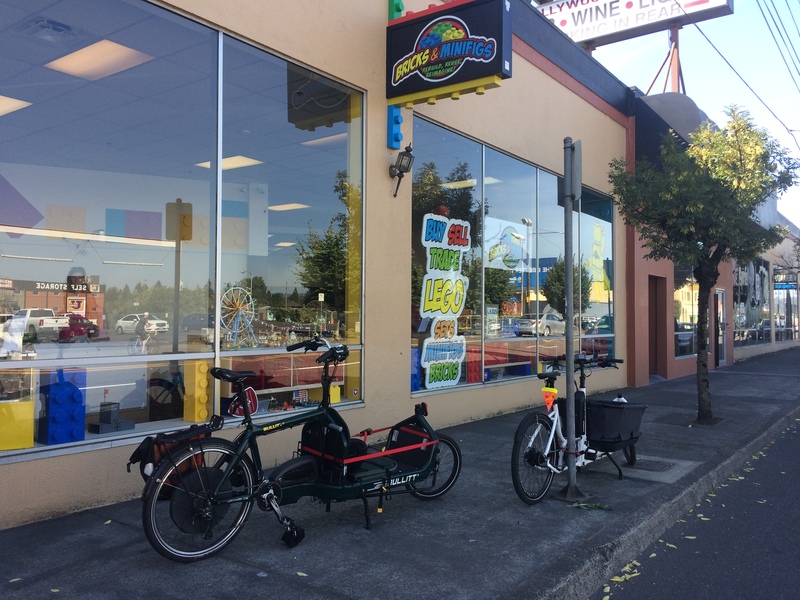 I crammed kids and luggage onto the bike for breakfast at nearby Tiny’s Coffee before returning the bike to Clever Cycles. Kath was a dear and carried my suitcase on her bakfiets while Kelley walked with us. This was just a few blocks to the bus stop, mind you, but you’ll remember we’re not accomplished walkers so it was plenty. It was great to have company. What a trip! HUGE THANKS to Clever Cycles for the use of the Douze. We were able to cover 90 miles over the week and go everywhere and do everything! I’m eagerly waiting for winter to be over so we can plan another visit. Obvs, Portland is visitable in the winter and we do that, too, but I want another visit like this one. Nice, you guys got around! It makes me want to set aside a few days to be a tourist in Portland, since we’ve got our routines down and rarely visit new places (winter gloom doesn’t help either). Also, bummer that Maple Parlor closed! We only managed to visit once, but it was nice. There’s a new yogurt place on Division called Eb and Bean that I’ve been meaning to visit. Maybe today–it’s actually sunny right now! I’m the same way here at home! I _could_ race all over town to do everysinglething in a weekend, but it really only feels imperative to do it all when we’re out of town. Thanks for the note and congratulations on replacing a car with a cargo bike!